Team Decaf will kick off the 2008 Tazza D’Oro cycling season beginning on Tuesday, April 1st – no foolin (6:15 pm sharp) and Team Caffeine will hit the road on Thursday, April 3rd at 6:15pm. Thanks to John for continuing to get things organized. John, are we really in our 8th year of Tazza D’Oro cycling? General info about our Tuesday and Thursday rides can be found by clicking here. John also posted a calender of rides (click here) plus info regarding our rules and ride cue sheets. We could use some help with leading rides. So, if you are interested in being a co-leader, please email John at jstrait@acm.org. Don’t forget we also carry the Bike Pittsburgh Cycling Maps – free – and also a few more copies of “3 Rivers on 2 wheels”. As the season kicks off we will be hosting some educational sessions in partnership with Bike Pittsburgh and many other cycling related events. 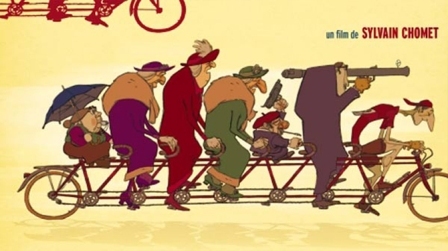 BTW, the picture above is from an ad for the movie “The Triplets of Belleville”. If you haven’t seen it or it’s been a while – watch it. We have a copy at Tazza D’Oro if you want to borrow it. It’s very French, extraordinarily creative, it’s about the the passion of strong women, human passion and the fine line of seeking happiness for ourselves and others. There are no words in the movie but the animation and the character’s mannerisms are unmistakable. Yea, I can relate on many levels but I hope to be part of the Tazza D’Oro rides again this year and hopefully there is someone behind me with “the whistle”! Looking forward to intercepting the decaf group again this week, after being pleasantly surprised last tuesday on my return ride home from Robinson (14 mi) and seeing 8 riders going my way up grant street. The main event of that ride, namely 57th street's hill, was a good challenge with panier rack and its contents of spare change of clothes, a couple'a tools, and my headlight battery, but It was a pleasure to learn a new connection I didn't know about before.